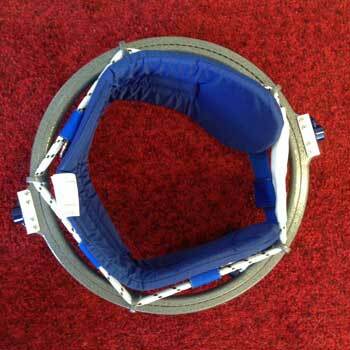 This Rotator Twisting Belt, also know as a twisting belt, is only 5 lbs. Belt is padded with 1/2" neopreneand covered with durable cordura fabric for extra comfort. An exclusivedual-attachement positioning system utilizes both bunji cord and super-strong webbing to maximize the twisting belt positioning within the twisting ring. This will keep your torso centered for easy friction free twisting. Permits spotting while student practices tumbling runs or other dynamic routines. Consists of all necessary ropes, pulleys, beam clamps and cables. Tumbling or twisting belt sold separately. Please Note: Suspensions longer than 40 ft. are not recommended. Belt not included. Enables an individual to spot students practicing tumbling or routines on various apparatus. Units come complete with ropes, pulleys, and beam clamps. Tumbling or twisting belt sold separately. Please provide floor-to-ceiling height as well as type, size and ceiling configuration when ordering in Special Instruction in post Add to Cart screen. Rig Attaches directly to any size trampoline frame for use where ceiling attachment isn�t practical or possible. Ships complete with ropes and pulleys; spotting belt must be ordered separately (click here). Please provide trampoline manufacturer and model number when placing order. 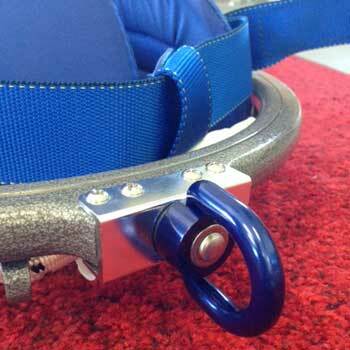 Our spotting belt is the most comfortable, best fitting on the market today! With a Quick-Release buckle system for efficient usage. 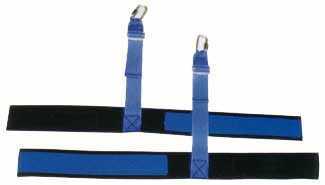 1"thick 4' lomg straps with swivel snaps for 2-person spotting.